As if someone waved a magic wand and said, "Bippity-bobbity-boo!” Lake Placid was transported to mid-winter in what felt like the blink of an eye. 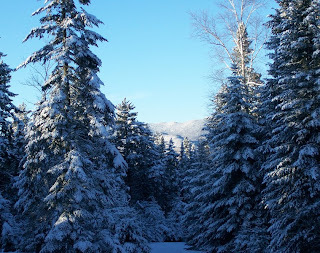 It actually took a few days, but now it certainly looks, feels, and sounds like winter here in the Adirondacks. The Olympic cross-country ski trails at Mount Van Hoevenberg officially opened today and are in beautiful shape with 25+ kilometers of the trail system groomed and track-set. The Porter Mountain racing loops open tomorrow. There is plenty of snow and the temperatures have been quite cold so it is of the nice, light, and fluffy grade. Skiing's great in New York State!